McKenzie, Van Dyke, Wasco, Jonas, Research Mannikins,Tohickon Glass Eyes,Payer Glass Eyes,Taxidermy Training Unlimited and Knobloch's products at affordable prices. Our website has a colour catalogue and online ordering facility to enable you to order 24 hrs a day. Telephone and email ordering are still available and no order is too small. Australian Taxidermy Supplies work at developing and supplying a quality range of products for all your taxidermy needs. There is always someone on the other end of the telephone who is willing to help you, or guide you in the right direction. Assorted Forms We manufacture taxidermy forms / manikins. We sell various deer species, boar, goat, fox, birds, antelope and other exotic animals. The Fallow, Sambar, Red, Rusa ,Hog Deer and Chital manikins are largely attributed to David Luxford's close association with "master" sculptor Ken Simpson. Ken Simpson is without doubt one of Australia's master taxidermists and sculptors. Ken has gone to extraordinary lengths to produce the finest range of manikins of trophy animals of the South Pacific. The Ken Simpson Collections are an investment in high quality Taxidermy Manikins and have improved the quality of taxidermy work by whoever uses them. We now also have available a range of Authorized Research Mannikins forms,the New Travis De Villiers range and the new for 2016 Pete Livesey range, these ranges will be expanding overtime. Eyes & Ears We carry a large range of premium quality hand painted glass eyes for various species of Deer, Boar, Goats,Foxes,Cats, Buffalo, Bird and Fish. Special eyes are also available, reptile, albino etc. If it's not a stock item we will order it for you. We also supply Optiform flexible ear liners ranging from as small as Rabbit, Fox & Goat, up to Sambar, Red Deer, Fallow, Buffalo, Kudo or Moose. We can supply most earliners to suit our mannikins with many Australian and exotic animals available. 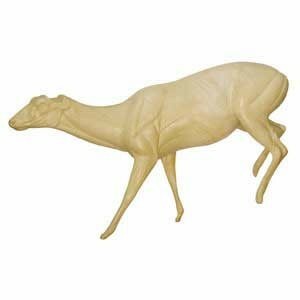 Accessories We stock all the extra items to make your Taxidermy projects easy to complete. Hide Paste, Apoxie Sculpt, Knobloch's tanning Chemicals, Skull Caps, Airbrush Paints, Cape Thread, Needles, Pins, De-greaser, Clay, Cip Resin, Ear Pliers, Ear Material, Scalpel Blades and Scalpel Handle , Pizzari Tanning Kits and Fleshing Knifes,Tools etc. We supply Ear Liners in small, medium, large (Sambar, Red Deer) and extra large (Buffalo, Kudu, Moose) sizes. Tongues & Jaws sets are also available, we have Dingo Jaw & Tongue, Elk Jaw & Tongue, Fox Jaw & Tongue, Pig Jaw & Tongue, Cat Jaw & Tongue or Tongue only sets. Anything you can not find in our Catalog can be ordered upon request. Australian Association of Wildlife Artists Inc.